ADDRESS: 2312 Haverhill Road, Tallahassee, FL 32312. Deerlake West past Middle School. Right on Waters Meet. Second left on Haverhill Road. House is on left. SQUARE FEET: 1918 sq. ft.
OTHER: Precious cottage in the woods! Immaculate and well maintained. 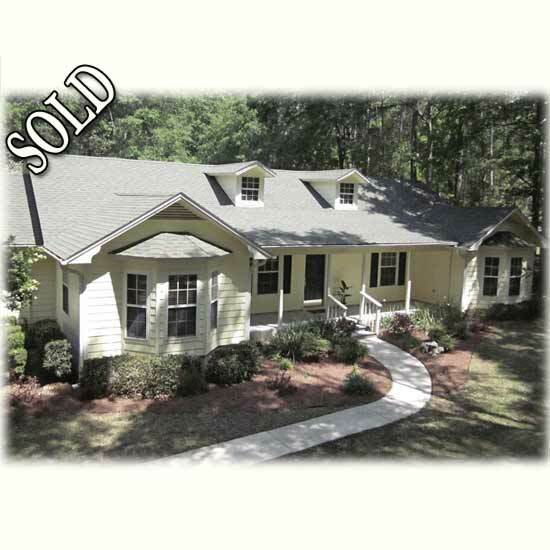 Popular Killearn Lakes with sought after schools. Vaulted great room overlooks covered patio and pool! Just in time for summer fun! Huge kitchen with breakfast nook in bay window. Separate dining room open to living rm with half wall-spacious! Great master suite with bay window and walk-in closet. Hall bath and 1/2 updated. Second and third bedroom are large. Super covered porch and pool out back. Very pretty landscaping surrounds the house. Oversized garage for storage or shop. Storage shed out back. Teddy is sweet little poodle; keep her inside. Will bark and then go nap.